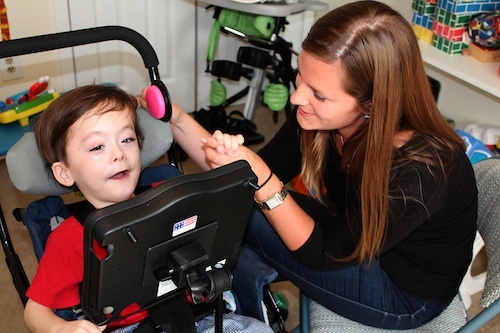 Jaclynne Dietrich helps Dylan communicate using a voice output switch. Six-year-old Dylan Vongrej was born with Canavan disease, a disorder that causes progressive damage to nerve cells in the brain. Dylan is non-verbal and unable to walk, but, according to his mother Noreen, “He understands everything you’re saying.” He’s also learning to communicate, thanks to speech therapy he’s receiving from Matheny as part of its Solutions For Schools program. Help available through Matheny Solutions For Schools includes: specialized evaluations, therapy services, home-based services and adaptive equipment and assisitive technology. For more information, call Linda Newsome, Director of Community Services, at (908) 229-7342 or email her at mathenysolutions@matheny.org. 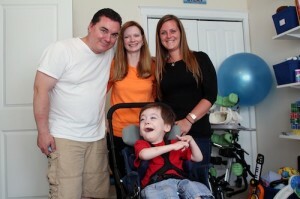 Dylan with, from left, his father Cliff, mother Noreen and speech-language pathologist Jaclynne Dietrich. This entry was posted in Uncategorized and tagged Dylan Vongrej, Solutions For Schools program. Bookmark the permalink.